ArKaos Pro, the leading provider of realtime visual processing technologies for live visual performances, has announced the appointment of ESL as its new exclusive distributor for France. The agreement is the first new appointment since the formation of ArKaos Pro was announced at Prolight + Sound, Frankfurt. ESL will be exclusively responsible for promoting, distributing and servicing ArKaos Pro’s Stage and Stadium media servers as well as the ArKaos MediaMaster Express and Pro software across the whole of France. Established in 1992, and with offices in Montpellier and Paris, ESL introduced the first comprehensive catalogue of stage lighting in France and has provided top class distribution and service across the country ever since. The company prides itself on enabling companies of all sizes to have easy access to high performance products at the best possible prices. ArKaos Pro customers in France will now be able to benefit from ESL’s accessibility and dedication to customer service. "We are very happy to be able to offer the ArKaos range to our customers," says ESL’s cofounder Alain Cornevaux. "Video has become a very important part of the entertainment technology scene and we have thought hard about which system to support. We chose ArKaos because their system is very powerful, yet logical and smart in the way it operates. At ESL we will only adopt new technology when we feel we have the in-house technical knowhow to back up our sales activities, and we are confident that with the ArKaos system we will be able to maintain our high level of technical service. "We also chose ArKaos because they are able to offer a full range of software and hardware that covers all our customers’ requirements from the simple and economical up to the full server options. And I must add at the end that we met a fantastic team at ArKaos." In addition to ArKaos Pro’s well established MediaMaster software, ESL will focus on promoting the Stage media server, which offers 2 outputs, and the new Stadium media server which features 6+1 EDID managed full HD outputs. 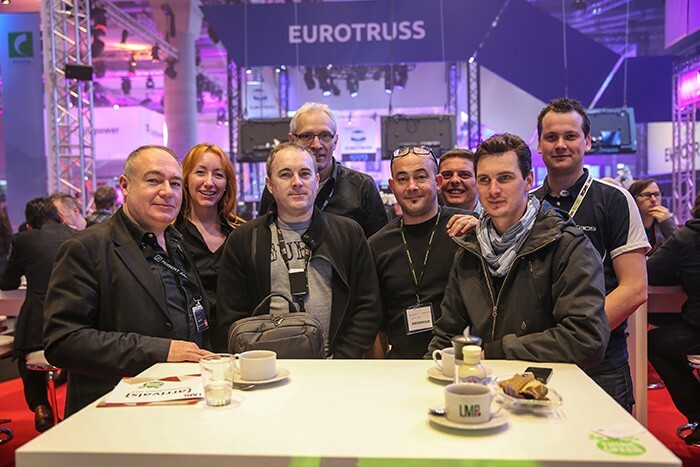 The ArKaos Stadium server received its official release at Prolight & Sound, Frankfurt where it drew a great deal of attention and excitement from the visitors. "The stand was buzzing with customers wanting to see the Stadium Server in action," says ArKaos business development manager, Agnes Wojewoda. "We had so many visitors to the stand we can truly say this was one of the best show’s ever for ArKaos. It was a very good forum, not only to launch our new division, ArKaos Pro, and our new products, but to announce the appointment of ESL as our new exclusive distributor for France and to welcome them to the ArKaos network of distributors. "We chose ESL because they understand the technology behind ArKaos products and have a strong presence in the French market. They have a very close relationship with their customers so can provide local product demonstrations and training sessions very quickly. This will make ArKaos products extremely accessible to the market including the television market where ESL is also very strong." 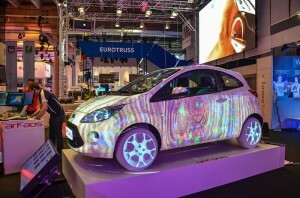 In picture: Video mapping on a car at the ArKaos Booth / Agnes and Toon from ArKaos with the team from ESL France.